Fancy trying out this oriental style recipe? It is relatively easy to make and does not require many ingredients, but you must allow for some time: the duck needs to marinade in order to pick up the combined flavors of the orange and tamari sauce. 3 TBSP tamari (NOT soy sauce, which contains wheat). Not everybody tolerates soy; my beloved does even though he has strong sulfite intolerance. The tamari sauce I use is organic. Prepare the marinade: wash the orange, press out juice, which should yield about 6 TBSP orange juice. Add 3 TBSP tamari sauce. Let duck sit in marinade, meat side down, for an hour. 1. 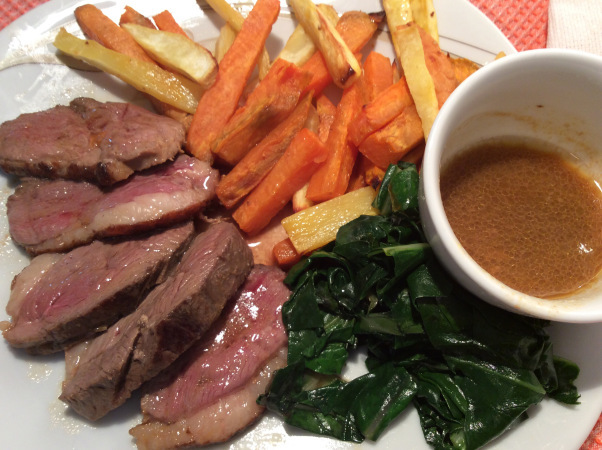 Protect your stove top from the grease that will splatter when you cook the duck breast! 2. Heat up an empty non-adhesive frying pan or wok. When very hot, place duck breast, fat side down, in pan WITHOUT the marinade. Cook for about 5 minutes on high (and that is when the bird avenges itself by spitting out all its anger in the form of duck fat!) and turn over. Lower the hea and cook an additional 5 minutes, or more, depending on how well done you like it. 3. WHILE DUCK IS COOKING, remove peel from ginger root (rating or peeling it). Cut up in small pieces and place it in a garlic press so as to press out about 1 tsp “ginger juice”. Add to reserved marinade. 4. Remove duck from pan; cut up diagonally into ½ inch slices. 5. Remove all but 1 tsp duck fat from pan. Pour ginger orange tamari marinade and cook on high heat for about 2 minutes, until reduced slightly. Transfer duck slices and turn off the heat. Let sit a few more minutes: the meat will let out some of its juices, which will give the sauce its final taste. 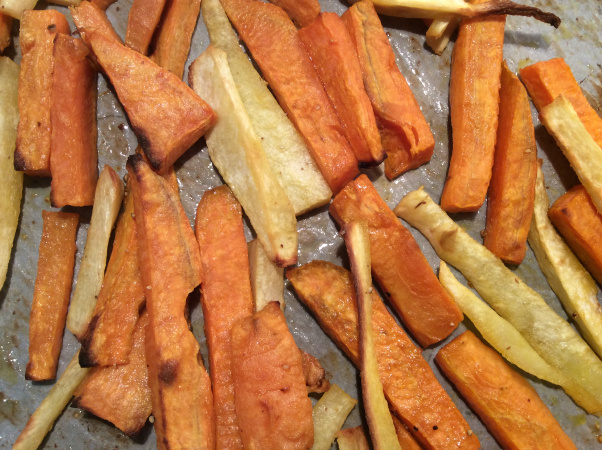 Served in the picture with bok choy greens and “sweet potato fries”: red and white sweet potato, cut up, sprinkled with olive oil and baked in the oven for half an hour. Previous easy gluten free breaded fish, better than fish sticks!